Before you even say it, no you do not need a food scale to replace your beloved measuring cups. It's not as if you've suddenly moved to Europe and all your recipes have been converted to grams and kilos. Nor do you only need a scale if you're concerned about portion control. The real reason that you need to get yourself a kitchen scale is for consistency in your recipes. Don't believe it? Try weighing a cup of sugar. A full cup of sugar should weigh 192 grams. However, when trying it out myself, I discovered that my cup measure contained a mere 155 grams. A full 36 grams less than it should be. That's almost a 1/4 cup - something I would have never known were it not for the digital multifunctional kitchen scale. While that's fine if you prefer your desserts to be a bit less sweet than a recipe calls for. If you're not expecting it, the results can be surprising. This inconsistency becomes especially disruptive to a recipe when the ingredients you're measuring out affect the texture of the dish. Maybe the best reason of all for investing in a scale, however, is that it will drastically cut down on your kitchen mess. All you need is a bowl, a spoon, and a scale and you can measure out all your ingredients. With a 5kg/11lb capacity, this scale has four sensors that will ensure that you get consistent measurements each time and every time. It's stainless steel body is not only sleek, but easy to clean as it repels those sticky fingerprints that inevitably get all over everything in the kitchen. Plus it's TARE function makes it seriously easy to measure out all your ingredients into one bowl. Welcome to your first mess-free cooking experience. Get yours from Amazon here for $13.99 while the sale lasts. Normally this product runs for $39.99 and it is one of the best digital kitchen food scales one the market. This model also has a 5kg/11lb capacity, but its physical buttons give you the satisfaction of knowing that you are accurately TARE-ing and measuring your ingredients each time you touch the scale. The Ozeri Digital Scale also has an enlarged surface onto which you can rest larger bowls for those times when you need to weight enough salad for the next three days. Plus, you can easily convert from metric to imperial systems to make trying out those fancy European recipes much easier. No conversions necessary with this digital kitchen scale. Get yourself one on Amazon here for $12.24. 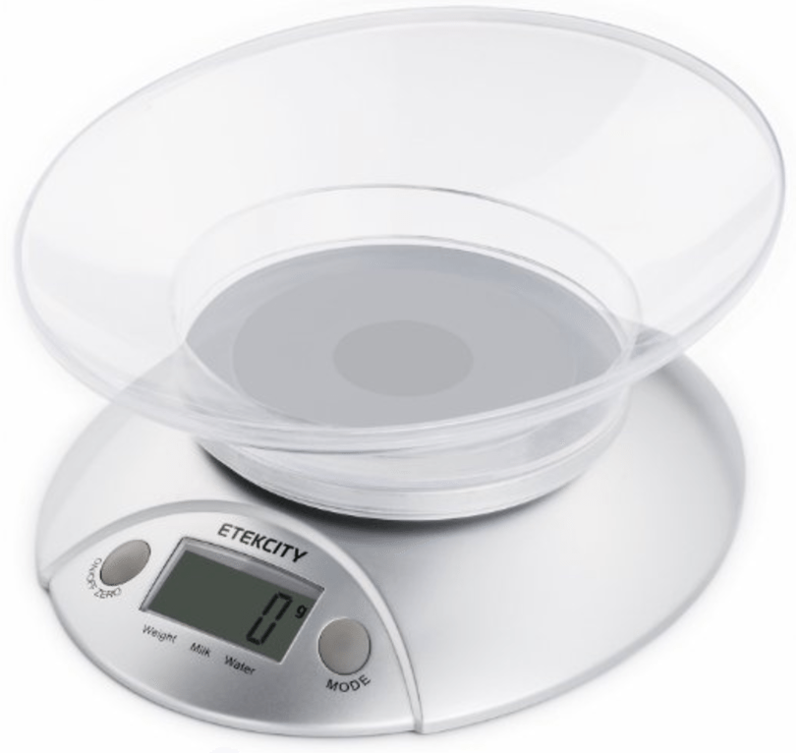 For those times when you just want a built-in bowl, there is the Etekcity Kitchen Food Bowl Scale. This lovely little contraption is multi-functional solution for those times when you need to mix your liquid ingredients and your dry ingredients. Now you don't have to measure them out separately. You can just measure them straight onto the scale. Don't worry, measuring directly into the bowl is not obligatory. It is easily detachable on the removable platform so you'll instantly have access to a familiar, easy-to-use scale. Get yours from Amazon here for $14.99 while the sale lasts. Normally this product runs for $29.99. This glass Accuweight kitchen food scale has the advantage of being made out of glass which makes it incredibly slick looking and easy to clean. Plus, its quad precision sensors provide you with overload protection so that you never damage your scale unintentionally. And as many of the comments mention, its red backlit display makes it easy to read at a glance which will save you those few extra steps when you inevitably forget how many grams you just weighed out. The sleek size is perfect for easy storage, a key component we considered when picking the best food scales. Get yours from Amazon here for $10.49 while the sale lasts. Normally this product runs for $49.99. Streamlined and compact, this Vont Digital Food Scale is like the little bear in Goldilocks - it's just right. With this stainless steel food scale, your next baking mission will be a cinch. You can even switch back and forth between metric and conventional measurements midway through a recipe and get accurate results. And it will save you so many dishes. Get yours from Amazon here for $9.99 while the sale lasts. Normally this product runs for $30.00.